Spring has sprung, and you’re going to love these spring ideas for preschool! Explore an amazing collection of books, printables, and resources for spring. The temperatures are finally on the rise. The birds are singing, and spring flowers are beginning to bloom. 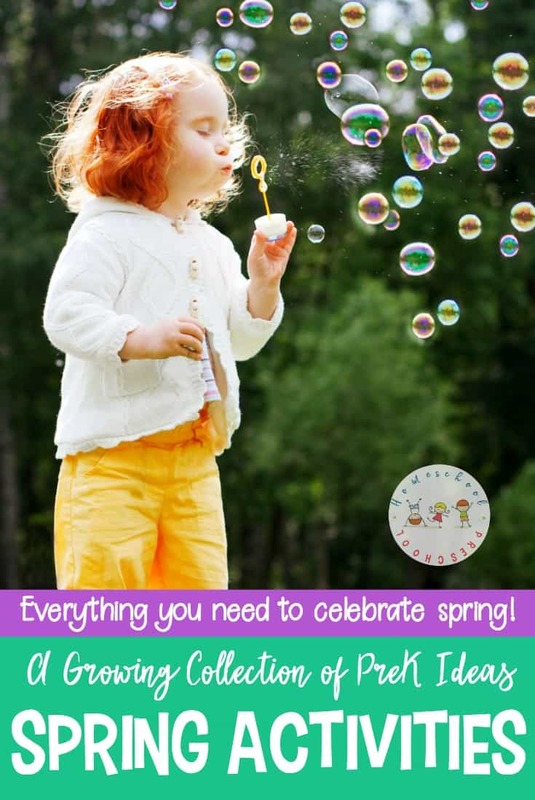 Scroll this ever-growing list to discover fun books, crafts, printables, and educational activities to do with your preschoolers this spring. • Easy Fingerprint Flowers Art Project for Preschoolers – Your preschooler will love making these easy fingerprint flowers! You’ll love the keepsake! • 19 Fabulous Frog Crafts for Kids – Are you looking for activities to teach your preschoolers about frogs? This is such a nice collection of frog crafts you can add to your homeschool preschool lessons. • Butterfly Life Cycle Paper Plate Craft – It’s spring! It’s a great time to learn about the life cycle of a butterfly. This spring craft for kids will help kids visualize the butterfly life cycle. • Adorable Baby Birds Nest Craft for Kids – Children of all ages will enjoy making this adorable baby birds nest craft! It’s a great addition to your spring lessons or your bird unit study. • Rain Crafts and Activities for Kids – If you enjoy a good spring rain, you’ll love these rain crafts and activities. They’re perfect for keeping tots and preschoolers busy on a rainy afternoon! • Fingerprint Flower Art for Tots and Preschoolers – Are you looking for a super simple craft to do with your kids? It doesn’t get any easier than this fingerprint flower craft! • 25 Adorable Crafts Featuring Bees for Kids – Fly on over and check out these adorable crafts featuring bees for kids. They’re perfect for spring and summer crafting sessions. • D is for Daffodil Preschool Flower Craft – This sweet daffodil preschool flower craft is perfect for spring! The free printable template makes this craft a breeze for little ones to make. • Bunny Paper Plate Craft – This bunny paper plate craft is perfect for your upcoming spring and Easter plans! It simple enough for even your youngest crafters to make. • Hands-On Preschool Measurement Activities for Spring – Want to introduce or practice measurement with your little learners? Check out these preschool measurement activities your kids will love! • 8 Preschool and Kindergarten Honey Bee Math Activities – These honey bee math activities are perfect for your springtime homeschool lessons. Focus on counting, adding, and number identification with these printable pages. • 2 Printable Frog Math Games – Preschoolers will enjoy playing this hands-on frog math game to help them practice counting and addition to ten. This fun math frog game is a fantastic addition to your spring homeschool lessons. • How to Celebrate National Jelly Bean Day with Preschoolers – Do your preschoolers love jelly beans? Then you’ll be delighted to know that April 22nd is National Jelly Bean Day! Discover five educational activities you can do with jelly beans. • Printable Earth Day Activities for Preschool and Kindergarten – Enhance your Earth Day preschool celebrations with this mini-learning pack. Add these Earth Day activities to your homeschool preschool lessons. • 20 Adorable Mother’s Day Crafts Kids Can Make for Mom – Each one of these Mothers Day crafts is designed for kids to create themselves. They’re a great way to show Mom how special she is. There are so many great ideas to choose from! • 9 Spectacular Star Wars Books for Children – A few of my kids adore Star Wars. They pretend to be Jedi. They build Star Wars Legos. And they devour Star Wars books for children! I don’t think they’ll ever get sick of Star Wars. They are true Star Wars fans! Celebrate Star Wars Day (May 4) with these picture books. • St Patricks Day Math Worksheets – Kids will love sorting, counting, and graphing with Lucky Charms. These St Patricks Day math worksheets for preschoolers are festive and fun! • Spring has sprung which means Easter is on its way. You don’t want to miss these Easter activities for preschoolers! Books, printables, snacks, and more! • 15 of Our Favorite Picture Books About Bees – Spring has sprung! Celebrate spring with a basket full of picture books about bees! Here are 15 of our favorites to get you started. • 25 of Our Favorite Children’s Books About Spring – Spring is just around the corner. It’s a great time to teach your preschoolers about all things spring – weather, butterflies, seeds, rainbows, and more. Here’s a list of 25 books about spring to get you started! • 27 Wonderful Weather Books for Preschool and Kindergarten – Young learners can learn all about the weather with the books featured in this collection of weather books for preschool and kindergarten. All 27 of these weather books for preschool and kindergarten readers are perfect for learning about the changing weather. • Our Favorite Picture Books About Moms – Celebrate Mom this Mother’s Day (or every day) with these picture books about moms. Keep these books handy to read stories about a mother’s love anytime! • 20+ of the Most Fantastic Frog Books for Kids – Get your preschoolers excited about amphibians with these frog books for kids. Whether you are exploring the life cycle of a frog or enjoying silly frog story books, pique your little ones’ interest with these. • Nonfiction Spring Books for Preschoolers – Introduce your preschoolers to the science behind spring with this collection of nonfiction spring books for preschoolers. From weather to flowers and everything in between, your little ones will love learning about spring! • 9 of Our Favorite Bee Books for Toddlers – 9 of our favorite bee books for toddlers! Engage your little ones this spring and summer with this great collection of board books featuring bees. • Spring Books for Toddlers – Check out this list of spring books for toddlers! These board books are perfect for toddlers and preschoolers to read this spring. • 15 Simple Fiction Books About Bees – Fill your spring and summer book basket with this wonderful collection of fiction books about bees. They’re perfect for young readers! • April Tot and Preschool Activity Calendar – What a fun preschool activity calendar for April! Celebrate holidays and special days with books, printables, and hands-on activities for tots and preschoolers. • Spring Fairies Preschool Printable Learning Pack – These fairies are here to make your preschool lessons more magical this spring. Be sure to download your Spring Fairies preschool printable learning pack today! • Spring Learning Pack for Preschoolers – Spring has sprung just in time for a new preschool printable! This spring learning pack is the perfect addition to your upcoming homeschool lessons. • Bee Themed Preschool Alphabet Matching Game – This preschool alphabet matching game is perfect for your spring activities! Your little learners will love helping each bee find its home! • Rainy Day Preschool Learning Pack – They say that April showers bring May flowers. Little ones will can focus on early math and literacy when you add this Rainy Day learning pack to your spring preschool lessons. • Bee-Themed Math Activities for Preschoolers – These honey bee math activities are perfect for your springtime homeschool lessons. Focus on counting, adding, and number identification with these printable pages. • Weather Worksheets for Preschoolers – Check out these FREE weather worksheets for preschool. They will help little ones learn colors, ABCs, and beginner math. They’re perfect for summer learning! • The Very Greedy Bee Preschool Book Companion – What happens when a greedy bee eats too much? Find out in The Very Greedy Bee by Steve Smallman! Then, print out this book companion which contains follow up activities for preschoolers. • S is for Strawberry Preschool Printables – Download these FREE strawberry preschool printables. They will help preschoolers practice shapes, ABCs, counting, and more! • Insect-Themed Summer Name Recognition Activity – The more name recognition activities you can do with your preschoolers the better. This insect-themed name recognition activity is perfect for spring and summer! • 20+ Educational Preschool Bee Themed Printables – Explore this wonderful collection of free preschool bee themed printables that focus on math, science, and literacy. There’s even a fun craft template for your little ones. • Bug-Themed Preschool Printables – If your preschooler loves bugs, he’ll love this fun bug theme preschool activity pack. It’s full of learning activities that are perfect for young learners. • Surprise Big Mouth Frog Printable Coloring Page – Print this big mouth frog printable coloring page for a cheap and easy activity for kids! Fold, color, and unfold for a fun surprise! • Growing Vegetable Soup Story Sequence Cards – Growing Vegetable Soup story sequence cards are a great way to help students retell this simple story. Includes picture cards, sequencing mat, and more. • Spring Sequence Cards – Don’t miss these spring sequence cards that include puzzles, a sequencing mat, and story telling page for 3 step sequencing cards. • Spring Sequencing Cards Printable – Kids will love ordering the events in this spring sequencing cards printable. This is a great way to introduce preschoolers to sequencing! • 25 Springtime Activities to Do Outdoors with Your Preschools – Get outdoors this spring, play, and explore nature with your preschoolers. These outdoor springtime activities are fun for the whole family! • 7 Ways Preschoolers Can Help with Spring Cleaning – Spring cleaning with kids doesn’t have to be a chore! Discover seven fun ways to involve even the youngest members of the family. • 20 Messy Play Ideas for Playing in the Mud – Playing in the mud is the perfect activity after a rainy day! No rain? No problem. Turn on the hose, and let kids get down and dirty with these mud play activities. • 22 Rainy Day Activities for Preschoolers – Come discover some fun rainy day activities for preschoolers to enjoy. Whether you spend the day indoors or outside in the rain, we’ve got you covered. • 25 Ideas for Outdoor Water Play for Kids – What can you do to entertain your kiddos on a hot spring or summer afternoon? Try one or more of these ideas for an afternoon of outdoor water play for kids. • 10 DIY Backyard Games for the Whole Family – Take Family Game Night to a whole new level with these DIY backyard games the whole family can enjoy including croquet, tetherball, ring toss, and more! • Tips for Teaching Kids to Ride a Bike – If you think your child is ready to take off the training wheels, here are things you should know about how to teach a kid to ride a bike. • 8 Outdoor Hand Eye Coordination Activities – Spring has sprung! Head outside, and use these outdoor hand eye coordination activities to help strengthen this skill with your preschoolers. The best part is, they’ll have so much fun doing them! • 5 Bee Activities for Preschoolers – Do you have a preschooler fascinated by bees? They’re a fascinating insect to study. So spend a day learning about them with these bee activities for preschoolers! • Spring Science Experiments for Preschoolers – Take advantage of all the new that spring has to offer, and try as many of these preschool science experiments as you can! 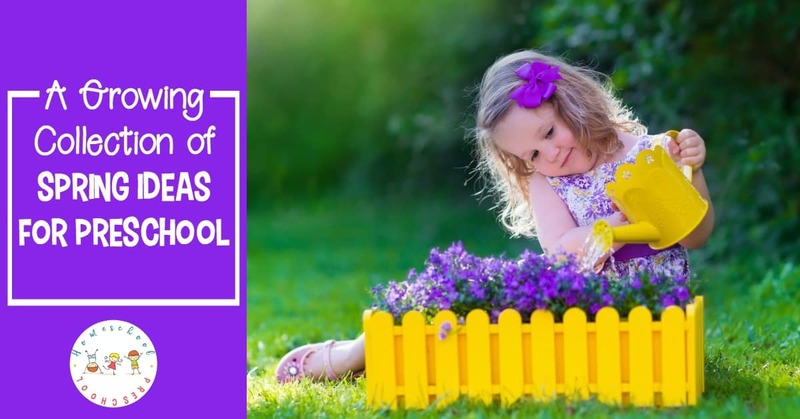 • 20 Spring STEM Activities for Preschoolers – Introduce springtime STEM into your homeschool preschool lessons with this amazing collection of 20 STEM activities for kids. • 22 Ideas for Gardening with Kids This Spring – There are so many benefits to gardening with kids. With this amazing collection of ideas and activities, your kids can learn about plants, try new foods, and tend their own garden spots. • How to Prepare for a Preschool Nature Walk – Do your preschoolers love being outdoors? Do they love exploring nature? If so, they’re sure to love taking a nature walk with you. Don’t forget to print out your scavenger hunts before you go. • How to Make a Frog Life Cycle Candy Science Craft – Follow this simple tutorial to make a frog life cycle candy science craft! Bring science to life with this fun, educational activity. • Honey Bee Life Cycle Activities– Honey bees for kids! Get ready to learn this this spring and summer with these fun, hands-on honey bee life cycle activities for preschoolers. • Engaging, Hands-On Activities Exploring Bees for Kids – Engaging, hands-on activities exploring bees for kids! Kids will love learning about honey bees with these fun facts and hands-on activities.